Practice works. The 2012 NFL Superbowl MVP Eli Manning actually played only 10 hours in 2012. He spent the other 2000 hours practicing – at training camp, in the gym, during film sessions and at practices. Sales may not be quite as bruising as football, but is the typical sales rep more expert than Eli Manning at their craft? If Eli practices 200 hours for every hour he needs to play, should the average sales rep be practicing less than 5 minutes for every hour they are in front of a prospect? That’s 2000+ times less practice! Deliberate practice is the only way to systematically develop expertise. Athletes do it. Musicians do it. Actors do it. Writers do it. Pilots do it. Trial lawyers do it. Reps need to do it, too. Role playing the key selling stories is the best way for sales reps to practice. Our clients use this system to raise the level of professionalism and conversation with their current prospects. They also continue to collect and practice their selling stories as their competitive environment and products change over time to ensure their ongoing sales success. SalesScale Partners built SharperAx, a webcam and cloud based sales training system, to help sales reps practice their selling stories so they can have consistently meaningful conversations with prospects. Using SharperAx to role-play the key questions, objection handling responses and selling stories across your industries, companies, customers, competitors, products and services is the best way for your sales reps to practice, get better and win more. Sales Scale Partners provides the services to make your SharperAx practice system really hum. 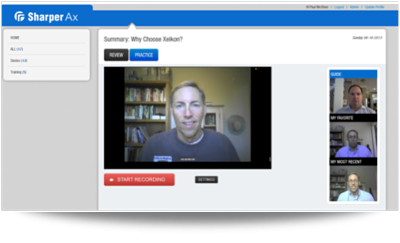 We will work with you to tease out your strongest selling stories and objection handling responses and coach your contributors on how to use their webcams to get these best practice videos into the SharperAx system. We will also work with your sales reps and sales managers to ensure they are practicing and coaching in a way that will systematically drive more meaningful prospect conversations. "If I had eight hours to cut down a tree, I'd spend six hours sharpening my ax."